An exploration of human behavior patterns as viewed through the lens of four specific tendencies. With data garnered from more than 600,000 participants in her online quiz, bestselling self-help author Rubin (Better Than Before: Mastering the Habits of Our Everyday Lives, 2015, etc.) contends that when individuals were asked the question, “how do I respond to expectations?” their responses aligned within four tendencies: upholders, questioners, obligers, and rebels. Upholders desire knowing what should be done and respond well to both outer expectations and inner expectations. Questioners question both outer and inner expectations and avidly seek out justifications before meeting an expectation. Obligers desire accountability and respond more readily to outer expectations but struggle to meet inner expectations. Rebels, who desire the freedom to do things their own way and on their own schedule, tend to resist all expectations. The author, a self-proclaimed Upholder, lays out plausible examples within sections devoted to each tendency, with consideration given to relationships, workplace dynamics, and family. 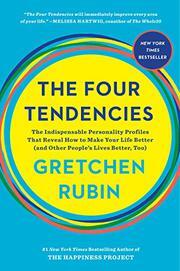 She offers the lofty assurance, “with wisdom, experience, and self-knowledge from the Four Tendencies, we can use our time more productively, make better decisions, suffer less stress, get healthier, and engage more effectively with other people.” Rubin’s study provides some interesting food for thought, and readers may find relatable examples from their own lives. Yet her analysis lacks psychological or scientific grounding, and it can lead to questionable conclusions—for instance, her assertion that these tendencies are hard-wired: “They don’t change depending on whether we’re at home, at work, with friends. And they don’t change as we age.” Furthermore, the author fails to provide adequate attention to socio-economic influences; the quotes and case examples all seem to come from middle-class white Americans, primarily women. A sometimes–thought-provoking but ultimately insubstantial assessment of human behavior. For devoted followers of this popular author.